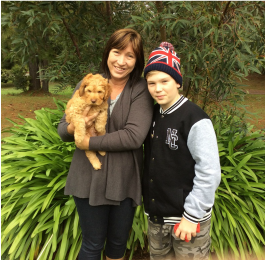 We are a small family business nestled on acreage in the beautiful Gold Coast Hinterland. We believe that the Labradoodle is not only a dog, but an intelligent and fun loving companion! Our Labradoodles are multi generational, meaning that they are born from Labradoodles with many generations of Labradoodles behind them. We have two Labradoodles ourselves - they live both inside and outside our home and bring us much joy! This is a family hobby for us, not a primary income source. All of our breeding dogs live in homes with their guardian families, so they are treated as very much loved pets. 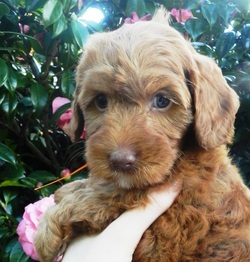 We breed small and small/medium Australian multigenerational Labradoodles only. At Misty Mountain we are committed to raising sound puppies, that with continued training and socialisation from their owners, will develop into confident, sociable and well adjusted adult dogs. All of our puppies are taken through a Bio Sensory program when they are young and we have adopted some of the Puppy Culture protocols. Our puppies have continued exposure to handling and new, safe experiences at certain times of their development which not only helps to stimulate the puppy and increase intelligence but also has a positive effect on their immune system and physical and emotional growth. We have small litters so that we can spend quality time with our puppies and really get to know them. Your puppy will be given the utmost of care whilst it is with us. It will not be raised in a kennel but will live indoors for the entire time it is with us. It will have fresh grass to run on when old enough and be exposed to many positive stimulation, sounds and experiences and different kind of people and adult dogs. Your puppy will be exposed to crate training. Read more about our furry family members and the parents of your future Labradoodle. Read some feedback from some of our many happy customers Australia wide.